In 2003 Doane Paper's founder Chad Doane is in a meeting to discuss final changes to a retail packaging project when he notices that half the room is using lined legal pads while the other half is using grid paper notebooks. What if the two stationery patterns are combined onto a single sheet so the user can utilize the two patterns simultaneously? After the meeting Doane makes some notes and packs away the idea for a rainy day. After Doane's dream of building a midwest based skateboarding company crashes and burns in 2005 he's suddenly left with a creative void. Sifting through his "idea journal" he finds the notes scribbled down after that 2003 retail packaging meeting. 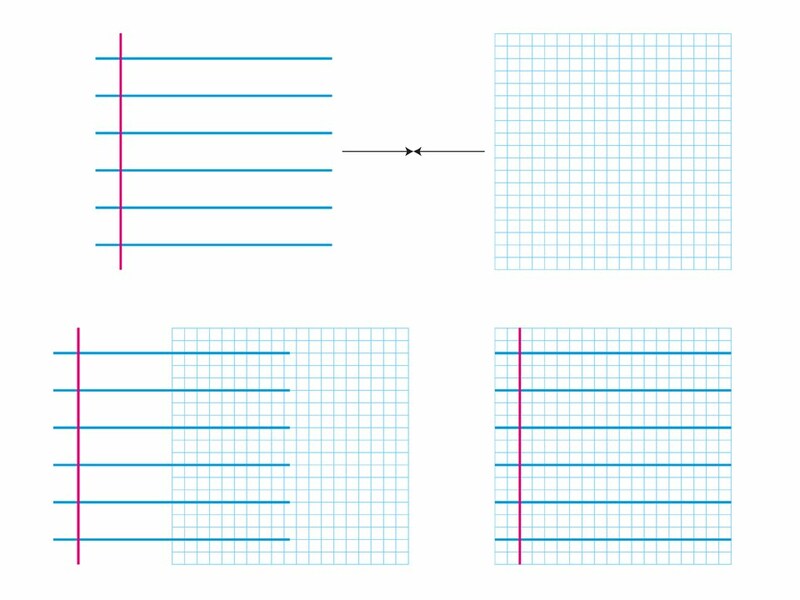 On November 8, 2005 Doane sits in front of a daunting blank Adobe Illustrator window and hashes out the original Grid + Lines pattern. 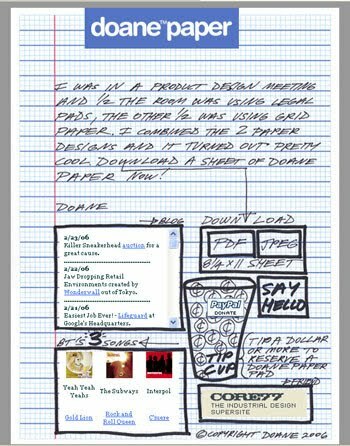 To test the new stationery pattern he builds a simple website where anyone can download a free PDF sheet of Doane Paper. Doane Paper's big break comes on December 22, 2005 when the creativity and innovation blog; Cool Hunting writes a blog post describing the attributes of Doane Paper. After the Cool Hunting blog post word spreads through the online design community about the idea of Doane Paper with blog posts showing up on NOT COT, Core77 and lifehacker among others. Soon visitors to doanepaper.com who had downloaded the free PDF sheet start to request that the Grid + Lines pattern be placed on a physical product like a sheet of notebook paper. Doane decides on the idea of a writing pad and finds a 50 year old Arkansas based school supply manufacturer to produce the first run of Doane Paper writing pads. The writing pad is an immediate success and is Doane Paper's sole product from the spring of 2006 until the fall of 2008. In the fall of 2008 the USA is headed into its greatest economic recession since the Great Depression. Caution is thrown to the wind and Doane quadruples Doane Paper's product offerings from the single writing pad to the small writing pad, idea journal and utility notebook. During this time a strong bond is formed with the pen review blog; The Pen Addict. The Pen Addict unofficially agrees to utilize a Doane Paper writing pad for its pen reviews thus greatly increasing the exposure of Doane Paper to writing instrument aficionados. 2009 starts off with a cherry bomb bang when the men's product site uncrate writes a post on Doane Paper's Black Utility Book. Because of the uncrate post Doane Paper has more orders in the first 3 months of 2009 than the previous 3 years combined. Other men's product blogs began to take note of the DP movement with Gear Patrol and A Continuous Lean kindly writing product posts. Doane Paper's first custom project takes shape with the storied boot maker Red Wing Shoes in 2010. A chipboard stock cover utility notebook is constructed for Red Wing's Heritage Collection with a vintage illustration of Red Wing's headquarters on the cover. Since its collaboration with Red Wing - Doane Paper has gone on to do custom work for uni-ball pens, the Colorado board of tourism, and UNIONMADE. In September of 2010 the Doane Paper Daily Arsenal Kit receives a very respectable 8 out of 10 review from WIRED. Doane taps the shoulder of famed Brooklyn based Alphastructaesthetitologist; Jon Contino to collaborate on a limited run of Utility Notebooks that incorporate his unmistakable hand-lettering artistry at the beginning of 2011. Doane Paper also forges a new path into leathergoods accessories with the debut of the DP Leatherworks line. The line is constructed out of Horween Leather, is made in the USA and includes 3 pieces. With the help of a brand new doanepaper.com 2013 sees the full transformation of Doane Paper the stationery idea to Doane Paper the stationery goods brand. Long time Doane friend Jeremy Collins lends a hand with illustrative work for the new site. The + dp division launches as an ongoing collaborative effort between Doane Paper and likeminded goods manufacturers to produce long lasting made in the USA products. The initial + dp partner is Denver's Winter Session. Doane Paper collaborates for a second time with TOPO designs on the TOPO designs + dp mountain briefcase version 2.0 in 2014. TOPO designs has engineered the mountain briefcase for a 3-way carry system which allows for a traditional two handle briefcase style, as a backpack with stowable straps, or over the shoulder with a removable shoulder strap. Doane Paper also introduces the utility notebook small in a six color variety pack and a large version of the standard utility notebook. 2015 is the 10 year anniversary of Doane Paper’s launch of the original grid + lines pattern and to celebrate the decision is made to construct something completely different. The cross-hair pattern left by the cameras used in the NASA Apollo mission photographs has always fascinated Doane Paper founder Chad Doane. Drawing from this inspiration the new pattern is called Moon Camera and is comprised of faint light blue crosses positioned with one inch spacing. The pattern is applied to Doane Paper’s most popular product tool the Idea Journal. INC. magazine includes Doane Paper in their February issue to begin 2016. Doane reaches out to long time friend Brandon Wilson to create an illustration depicting Doane's studio desk junk drawer for a t-shirt . In the summer months Doane Paper is invited to and participates in the pop up retail installation - Design Market at New York City’s Seaport Studios / NYC x DESIGN. The Design Market is an innovative retail installation occupying the ground level of the Seaport Studios, offering a carefully curated selection of design objects. For the third year in a row Doane Paper ships over 500 large Idea Journals to Oak Park River and Forest High School (Oak Park IL) in 2017. The Idea Journals are used in advanced Math and Chemistry classes. In 2018 Doane Paper rides the rails with the debut of BOXCAR a new stationery format / utility notebook that neatly produces rectangle drawn shapes from a common folding map - train track element. The notebook’s interior cover walls are filled with symbols that were drawn or carved onto trees, posts, buildings or bridges to offer warnings and directional guidance of what lay ahead for the watchful freight hopper.